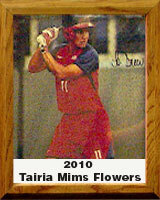 Tairia’s spectracular softball career started at Salpointe Catholic High School. She was a four-year starter and was an all-star selection all four years. Salpointe won the state title in her freshman year and finished second in her senior season. Tairia enrolled at UCLA and hit a three-run home run in her first collegiate at-bat as a freshman. She started every game as a freshman, and had the second highest batting average in the women’s College World Series for the runner-up Bruins. As a sophomore, Flowers was a second-team All-America selection and first-team All-Pac-10. The Bruins finished second in the World Series. In her senior season, Flowers was first-team All-Pac-10, All-American, and played on the All-College World Series team. UCLA won the national championship. Flowers finished second in career home runs (61) at UCLA, second in career runs batted in and first in career doubles. She was on the U.S. Junior Olympic team that won a silver medal in Taipei, Taiwan in 1999, and on the 2003 gold-medal-winning Pan American Games team in Santo Domingo, Dominican Republic, hitting .538 with two home runs. Flowers won a gold medal with the 2004 U.S. Olympic team and a silver medal with the 2008 U.S. Olympic team.